Rubber Room Ramblings: HOUSE OF HAUNTS! 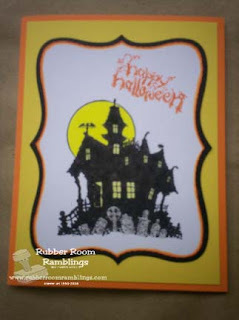 This year I treated myself to a new Halloween stamp set. It is called House of Haunts, and I'm having lots of fun with it! For this card, I embossed and colored it. I love how colorful and fun it is. I used two Big Shot Top Note dies, one in Basic Black cardstock and one in Whisper White cardstock. I simply trimmed the Whisper White Top Note and then sponged some Only Orange Classic Ink on the edges of it.